Fiscal Fantasy wins the Group 3 Manawatu Breeders Stakes in NZ. Cheers from Riverbank Farm, Benalla as Fiscal Fantasy stormed home to an impressive victory in last Friday’s Group 3 Manawatu Breeders Stakes at Awapuni. The classy and consistent mare who trainer Frank Ritchie describes as being “as tough as they come with a heart bigger than herself,” is Group winner number two for Riverbank resident Skilled, a Group One winning son of the wonderful stallion Commands. Commands is a grandson of the legendary broodmare Eight Carat and the dark and handsome Skilled has always had a bit of a look of that great influence – making it interesting to note that Fiscal Fantasy is bred on a 3 X 3 cross of Commands’ dam Cotehele House. Bred in Victoria by Wingrove Park and sold at the 2016 Inglis Melbourne Premier Yearling Sale, fetching $43,000, Fiscal Fantasy made her way to New Zealand where she quickly found form – placed at two, easily breaking her maiden over a mile at three. Up in class she also won her next start before tackling Group company three starts in a row, not far away without the best of luck. Kicking off her current campaign in the spring, she has had nine runs – a fast finishing fourth her worst result! 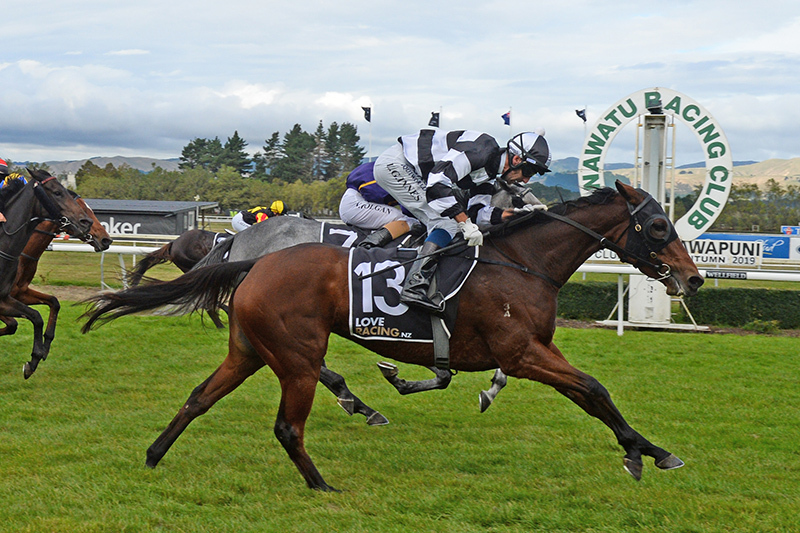 A winner over 2100m at Waikuku in mid-December, she was in the placings at four consecutive runs before her impressive breakthrough on Friday. Settling well back from an outside barrier, Fiscal Fantasy swung wide into the straight and charged! The Group 2 Travis Stakes is next for Fiscal Fantasy as she attempts to become Skilled’s second two times Group winner, his first being the genuine Joseph Pride trained mare Pecans, winner of six of her 19 starts including the Group 3 Belle Of The Turf Stakes and the Group 3 Godolphin Crown as well as the Listed Ladies’ Day Cup. Skilled has been enjoying a good run of late with a number of promising new winners including The Great Bratski (easy Sale maiden winner despite sitting wide on pace), Shoot for Coomaah (wore the leaders down in game fashion at Wangaratta), Criterium, Centre Scoota, Clever George, Appollo Jet and Francisco Pizaro. Meanwhile Rosaria Caterina has bolted in with her last two in NSW whilst Come On Carl was a tough two times winner over the summer. The return the promising times spring Morphettville winner Miss Jane is keenly anticipated whilst the lightly raced Jochberg looks close to another win after finishing a close up fourth at Sandown a couple of weeks ago. A Group 1 winner at two of the AJC Champagne Stakes and at three runner-up in the Group 1 Randwick Guineas, Skilled has not only type and performance – but pedigree as well, being one of the ever reliable Commands (a horse who boasted an outstanding 71.9% winners-to-runners strike rate) 58 stakes winners whilst his dam is the wonderful mare Dextrous. The winner of five of her ten starts including the Group 2 Sandown Guineas and the Group 3 Vanity, Dextrous has been represented by seven winners from as many runners including the Group Two winners Ambidexter and Sidestep – both of whom are also doing a good job at stud. Whilst Ambidexter has sired 18 winners from his first two crops with limited opportunities, Sidestep has been in the headlines having sired, from his debut crop, the Golden Slipper heroine Kiamichi. Skilled stands at a fee of $3300 (incl gst) with special deals regarding reproductive vet costs on offer. He is part of a strong Riverbank roster, standing alongside Winx’s half-brother Boulder City, the consistent Redente, the Caulfield Guineas winner Anacheeva, the VRC Sires Produce winner Von Costa de Hero and the impeccably bred Wayed Zain.